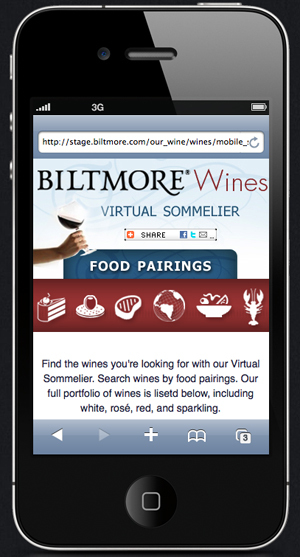 Biltmore asked us to design and launch a mobile version of their Virtual Sommelier, and it just launched today. The Biltmore is very excited! This will be the first of many mobile sites for them. Everything looks great! We’re very excited to launch our first mobile web app! Please thank your team for all their great work on this project. Mobile websites are coming on strong, and can really do a lot for a business. Everyone has some sort of mobile device attached to their hand. Making our clients ready to receive all of this consumer traffic is a must. We also created a QR code for Biltmore Wines to place on products in grocery stores across the country. This helps consumers zap their way straight to our new Virtual Sommelier. (For more information about what QR Codes are and how useful they can be, see our blog post here.) Mobile sites go hand in hand with these convenient super codes. You can play around with the desktop version here. Or, you can use this QR Code and check out the mobile site for yourself! Let us know what you think about the mobile site in the comments section below or on Twitter @RiversAgency. We always love feedback! What a great idea. Can’t wait to download and try it out. Wow! Thats really cool. I’ll have to get that app! Great blog info on QR codes and even better to see it in action on Biltmore’s Mobile site. I love the new Capel Rug TV spot with Sarah voiceover…Peggy Great Job!